We think there’s a real need in the Napa Valley for more thought-provoking programming and events you can’t find anywhere else. That’s why we founded the Napa Center for Thought & Culture. The plight of refugees is a major global crisis. One person was displaced every two seconds in the past year. 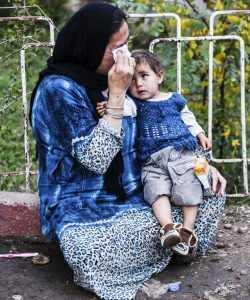 (www.Actionagainsthunger.org) The vast majority of the countries hosting refugees are among the world’s least developed. Refugee status is rarely temporary. More than half the refugees around the globe are under the age of 18, even though children make up 31 percent of the world’s population.This evening brings together a refugee and resettlement expert, medical workers who work in refugee camps, and an engaged audience. Presentations will overview the refugee crises and recent accounts of the refugee camps in Lesbos, Greece and the Mexican Border. A light dinner will be served and audience members will engaged in round-table discussions of the refugee crises and potential actions. Become Part of the Center 100! Today we ask you to become part of the Center 100: one hundred people who contribute $1,000 each, to help the Center attract the kind of programming that feeds the mind and nourishes the soul, helping us realize an ambition to bring the extraordinary artists, thinkers, authors, musicians, and others long absent in our community. As a member of the Center 100, you will be acknowledged as such in the Center’s website, recognized at events, and enshrined as a founder central to the organization’s success.